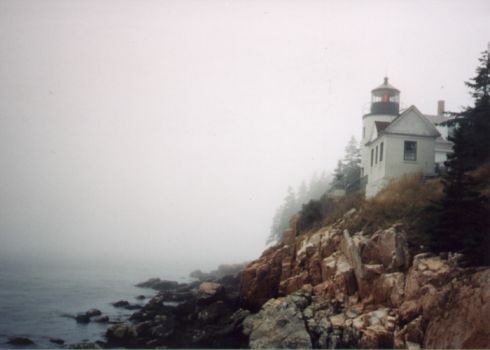 Bass Harbor Lighthouse was built in 1858 and sits on the southwestern point of Mount Desert Island, in Maine. The lighthouse stands only 32 feet tall, but perched on a rocky ledge, has an actual focal plane of 56 feet. Automated in 1964, the Coast Guard now maintains the grounds, and an officer resides at the keeper's quarters. Recently, there have been several improvements to the observation trails. These trails are not a difficult walk and lead to a great view of the lighthouse on its left side, overlooking the harbor. Bass Harbor Lighthouse is located in Acadia National Park and is popular with the vacationers, especially in the summer months.